In his 2008 best-selling book, Outliers, author Malcom Gladwell examines the various factors that contribute to high levels of success. A common theme that appears throughout the book is the “10,000-Hour Rule,” which suggests that proficiency and skill at a particular craft requires at least 10,000 hours of practice. Some examples used in the book include Bill Gates’ time spent coding computer programs as a teenager before founding Microsoft and The Beatles’ hundreds of nightly performances played in German strip clubs in the early 1960s before bursting onto the scene in England in 1964. Gladwell’s point is not that 10,000 hours of practice automatically leads to world-class expertise within a particular field. His point is that true mastery of a profession is the result of natural ability/talent COMBINED with tireless repetition over a long period of time. Ten thousand hours is equivalent to roughly 3 hours a day (or 20 hours a week) over a period of 10 years. Spending 3 hours per day for 10 years practicing the piano, playing a sport or any other hobby would seem to establish some level of success – assuming a certain degree of underlying talent or capability. Ten thousand hours is also equivalent to working at any full-time job for a period of 5 years. In my relatively short career, it’s hard to imagine someone being proficient at their particular job without at least 5 years of experience in it. So, while the 10,000-Hour Rule isn’t some black and white threshold for success, the spirit of the rule has strong validity. The 10,000-Hour Rule brings to mind the value incrementalism in life. Incrementalism is a method of making very small degrees of change over a long-period of time. Individually, or in the short-term, each degree of change is hardly noticeable. Over the long-run, however, the value of these collective incremental changes can produce awesome results. The most common example that illustrates the value of incremental change is diet and exercise. Eating relatively healthy and exercising for a single week isn’t going to make much of a difference. After a month, perhaps small noticeable results start to appear. But doing so consistently over the course of a year (or longer) will likely drive significant change in health and/or physical appearance. Nothing of value was ever built overnight. This is true of successful businesses, new processes and high performing individual talent. Success in almost anything requires a long-term commitment to a process. Understanding and pursuing incremental change is difficult in today’s world. Most of society focuses on short-term results and instant gratification. Rather than slow, incremental change over the long-term, we want radical change NOW! The 30-Day Weight Loss Program. Five Easy Steps to Become a Millionaire. Take 5 Strokes Off Your Golf Game With This One Tip. Quick and exciting solutions are always easier to sell than slow and boring processes. 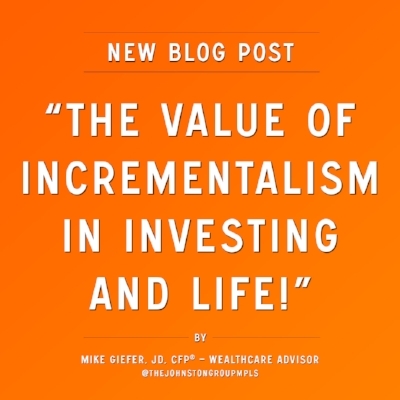 The long-term value of incremental change also plays out in successful investment strategy. We know from Nobel-prize research and decades of historical data that implementing a slow and boring investment strategy over the long-term is more likely to deliver superior performance than other “more exciting” approaches. Regular, consistent savings into low-cost, diversified portfolios will beat almost any type of active investment management over longer time horizons. Still, people are always pursuing the one stock that will change their life overnight. Take, for example, the current cryptocurrency craze. I have no idea how this market will play out over time. No one does. Still, I’d be willing to bet that most people investing in blockchain couldn’t even explain how it works. But that desire to triple their investment over the course of a week is much more exciting than investing in an S&P 500 index fund. Investing in an index fund isn’t going to produce much growth over the course of one month. Doing it for a few years still probably won’t excite many investors. But over the course of a few decades? The awesome power of time and compounding interest will start to show itself. One of the more smartest investing analogies is that successful investing is like planting oak trees. One day’s progress shows nothing. A few years’ progress shows a little. Ten years shows something big and decades later something truly magnificent is realized. The New York Times’ Carl Richards (the “Sketch Guy”) touched on this topic last year with a simple visual (below). There’s no 10,000-Hour Rule that applies to successful investing. 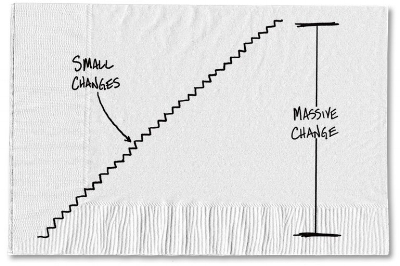 But understanding the importance of small, incremental change over time adds a lot of value in understanding how to most effectively grow your wealth.